The below single digital photo painting is a digitally manipulated photo of the lady in the striking Peter Jaco Hat! Digitally enhanced photo of lady in striking Peter Jago Hat Photo taken by Karen Robinson – Abstract Artist NB All images are protected by copyright laws! The below single digital photo painting is a digitally manipulated colour cropped photo of the lady in the striking Peter Jaco Hat! I did a range of photos where I digitally enhanced the photos so that you only viewed part of the person’s face and I found these photos more interesting than a view of the whole face. In this photo I love how the colours pop out, reds and pinks and how the eyes deepen, contrasting against the vivid white back ground. 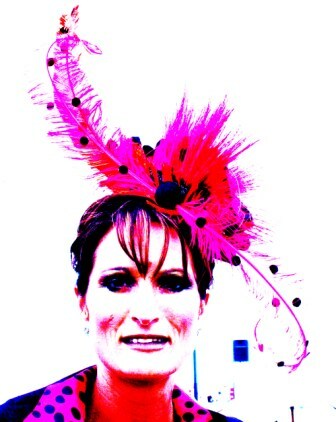 Digitally enhanced and cropped colour photo Lady in the striking Peter Jago Hat taken by Karen Robinson-Abstract Artist NB All images are protected by copyright laws! 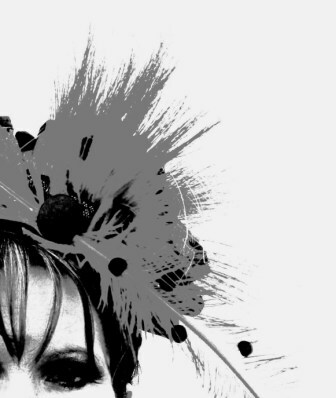 Digitally enhanced and cropped black & white photo Lady in the striking Peter Jago Hat taken by Karen Robinson-Abstract Artist NB All images are protected by copyright laws! The below single digital photo painting is a digitally manipulated and abstracted small view of the lady’s spotted dress. Abstract Digital Photo Painting No. 2A – “Derby Day – Spotted Dress” 2008 by Abstract Artist: Karen Robinson NB: All images are protected by copyright laws! The below single digital photo painting is another version of a digitally manipulated and abstracted small view of the lady’s spotted dress. 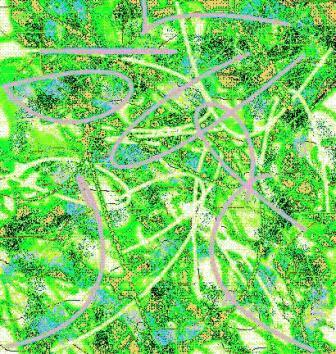 Abstract Digital Photo Painting No. 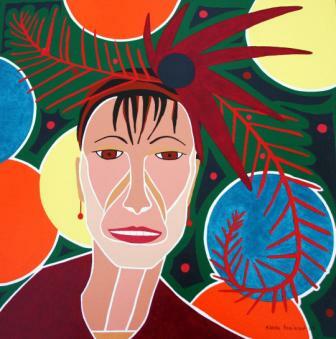 2B “Derby Day – Spotted Dress” 2008 by Abstract Artist: Karen Robinson NB: All images are protected by copyright laws! 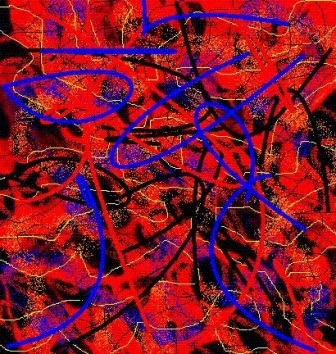 This entry was posted in 2009 Abstract Paintings/Stories, Abstract Digial Photo Painting Portfolio, Abstract Painting Portfolio, Abstract Painting Portfolio Overview, I Do Art Discussions, My art, Single Abstract Digital Photo Paintings and tagged Abstract Artist, abstract paintings, Fashion, Flemington Racecourse, ido art karen robinson, Peter Jago, Photography, The Rails, Victoria Derby Day Melbourne by idoartkarenrobinson. Bookmark the permalink.